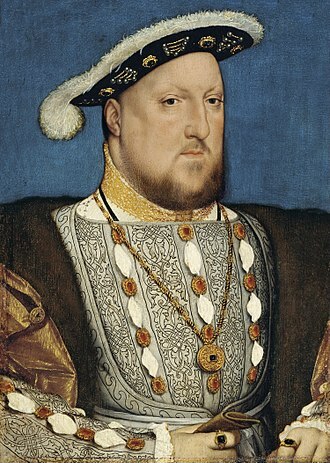 Edward was allegedly born in December 1473 at Middleham Castle, a stronghold close to York that became Richard and Anne's principal base in northern England. The date of 1473 is, however, not universally accepted; Professor Charles Ross wrote that the date 1473 "lacks authority. In fact, he was probably not born until 1476." 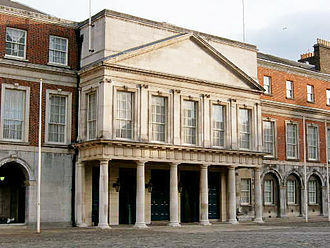 The act of Parliament that settled the dispute between George of Clarence and Richard over Anne Beauchamp's inheritance just as if the Countess of Warwick "was naturally dead" was dated May 1474. The doubts cast by Clarence on the validity of Richard and Anne's marriage were addressed by a clause protecting their rights in the event they were divorced (i.e. of their marriage being declared null and void by the Church) and then legally remarried to each other, and also protected Richard's rights while waiting for such a valid second marriage with Anne. 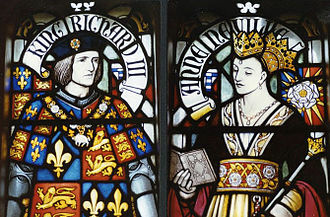 There were no provisions, however, for their heirs in case of this said divorce, which seems to confirm Richard and Anne had no children as of 1474. But such provision was the provence of the ruling king for those of royal blood so would have been moot. Edward was mostly kept at Middleham, and was known to be a sickly child. 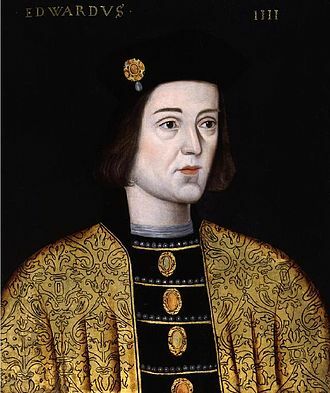 On 26 June 1483, his father became King of England, deposing his nephew Edward V. Edward did not attend his parents' coronation, likely due to illness. 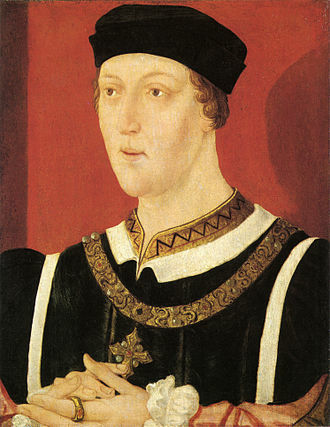 He was created Prince of Wales and Earl of Chester in a splendid ceremony in York Minster on 8 September 1483, following his parents' royal progress across England. 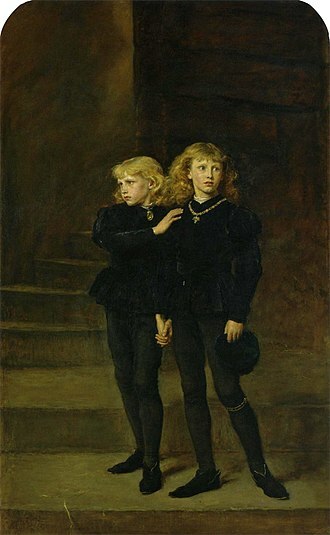 Edward's sudden death left Richard without a legitimate child and heir. 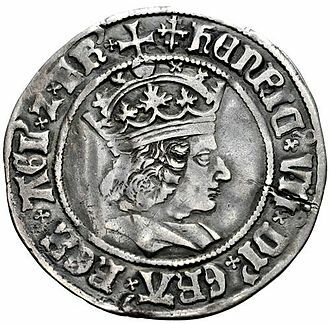 Contemporary historian John Rous recorded that Richard declared his nephew Edward, Earl of Warwick, his heir in his place, but there is no other evidence of this. 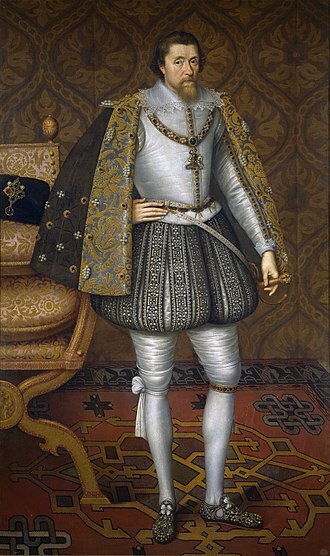 Similarly, John de la Pole, 1st Earl of Lincoln also seemed to have been designated as Richard's new heir, but was never publicly proclaimed as such. 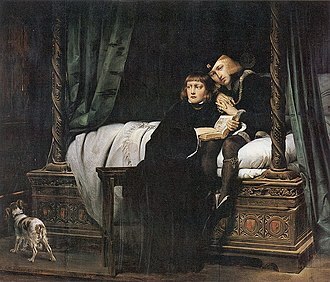 Richard's enemies were inclined to believe that Edward's sudden death was divine retribution for Richard's alleged involvement in the usurpation and subsequent disappearance of the sons of Edward IV, Edward V of England and Richard, Duke of York. The location of Edward's burial is unknown. 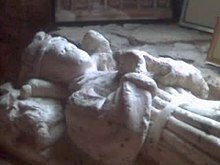 A mutilated white alabaster cenotaph ("empty tomb") in the church at Sheriff Hutton with an effigy of a child was long believed to represent Edward of Middleham, but is now thought to be an earlier work depicting one of the Neville family. It is perhaps most probable that Edward, having died in Middleham Castle, was buried in the nearby parish church of Saints Mary and Alkelda in Middleham, where his father had intended to found a college. However evidence for this suggestion is lacking. Edward of Middleham appeared in Sharon Penman's The Sunne in Splendour and in Sandra Worth's The Rose of York series. 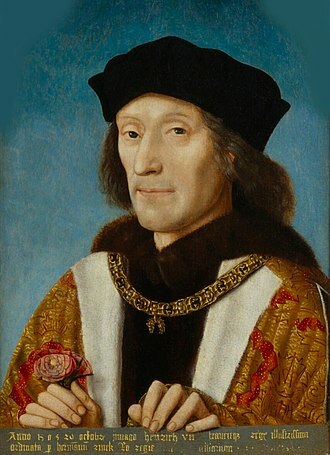 In the latter series, it is implied that Edward was poisoned at the behest of Margaret Beaufort, as part of her efforts to secure the throne for her son, the eventual Henry VII. Edward of Middleham is a character in Joan Szechtman's Loyalty Binds Me, her 2nd book about Richard III in the 21st century. Edward of Middleham also appears in Phillipa Gregory's Cousins' War series, and in the TV adaptation of the novels, The White Queen. 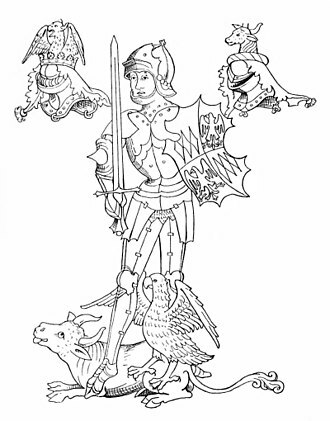 From 1483 to 1484, Edward used the arms of his father, debruised with a label of three points Argent. ^ "Official Website of the British Monarchy". royal.gov.uk. Archived from the original on 8 October 2009. ^ a b c d "- Person Page 10163". thepeerage.com. ^ Ross, Charles. Richard III (Univ. of California Press, 1981) ISBN 0-520-04589-0, p. 29, n22, citing P. W. Hammond Edward of Middleham, Prince of Wales (1973) pgs. 12, 35-6, and also T. B. Pugh, Glamorgan County History III (1971) p 687. ^ "Princes of Wales". englishmonarchs.co.uk. ^ Kendall P.M., Richard III, 1955. ^ Pierce, Hazel, Margaret Pole, Countess of Salisbury 1473-1541 (University of Wales Press, 2009), p. 9. ^ Wagner, John, Encyclopedia of the Wars of the Roses, ABC-CLIO, 2001, p. 211-212. ^ Routh P. and Knowles R (1982). The Sheriff Hutton Alabaster Reconsidered. Wakefield Historical Publications. Kendall, Paul Murray (1955). Richard the Third. Allen & Urwin. ISBN 0-04-942048-8. Panton, Kenneth J. (2011). Historical Dictionary of the British Monarchy. Scarecrow Press. ISBN 0-8108-5779-0. 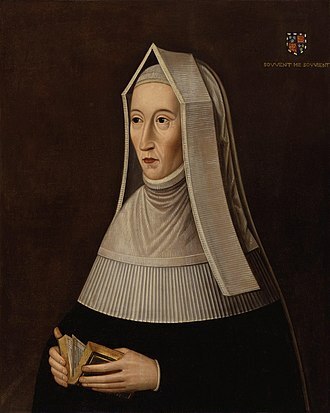 Joan Beaufort, Countess of Westmorland, was the fourth of the four children of John of Gaunt, 1st Duke of Lancaster, and his mistress, Katherine Swynford. In her widowhood, she was a landowner in the North of England. She was probably born at the Swynford manor of Kettlethorpe in Lincolnshire and her surname probably reflects her fathers lordship of Beaufort in Champagne, where she might have been born. 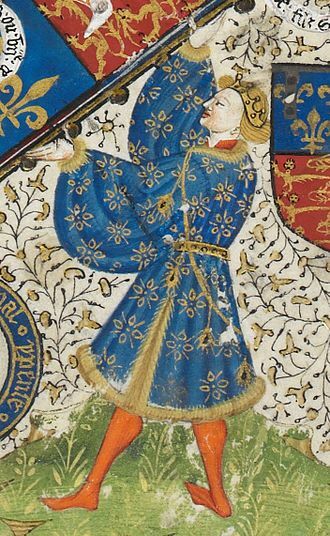 In 1391, at the age of twelve, Joan married Robert Ferrers, 5th Baron Boteler of Wem, at Beaufort-en-Vallée and they had two daughters before he died in about 1395. 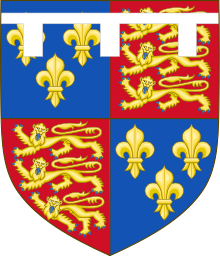 Along with her three brothers, Joan had been privately declared legitimate by their cousin Richard II of England in 1390 and her parents were married in Lincoln Cathedral in February 1396. Joan was already an adult when she was legitimized by the marriage of her mother and father with papal approval. 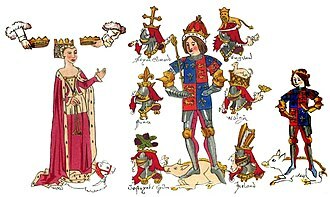 Soon after the legitimation, on 3 February 1397, when she was eighteen, Joan married Ralph de Neville, 1st Earl of Westmorland, who had been married once before. 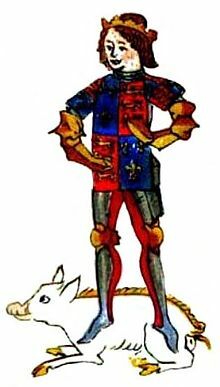 When Ralph de Neville died in 1425, his lands and titles should, by law of rights, have passed on to his grandson through his first marriage, another Ralph Neville. Instead, the bulk of his estate went to his wife, Joan Beaufort, even though the title Earl of Westmorland. Joan, with her blood and connections, was far too powerful to be called to account. 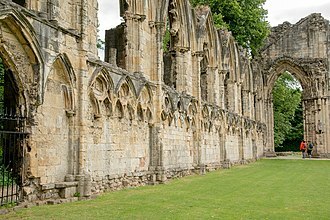 Inevitably, when Joan died, the lands would be inherited by her own children, Joan died on 13 November 1440 at Howden in Yorkshire. Rather than be buried with her husband Ralph, she was entombed next to her mother in the magnificent sanctuary of Lincoln Cathedral. A1640 drawing of them survives, showing what the tombs looked like when they were intact, Henry married Elizabeth of York, daughter of Edward IV, and their son became Henry VIII of England. Henry VIIIs sixth wife, Catherine Parr, was a descendant of Joan through Joan and Ralphs eldest son, Richard Neville, 5th Earl of Salisbury, the Earl of Salisbury was father to Richard Neville, 16th Earl of Warwick, the Kingmaker. Philippa Gregory is an English historical novelist who has been writing since 1987. The best known of her works is The Other Boleyn Girl, audioFile magazine has called Gregory the queen of British historical fiction. Philippa Gregory was born on 9 January 1954 in Nairobi, the daughter of Elaine and Arthur Percy Gregory. When she was two old, her family moved to Bristol, England. She is not related to novelist, Susanna Gregory and she was a rebel at Colstons Girls School where she obtained a B grade in English and two E grades in History and Geography at A-level. She worked in BBC radio for two years attending the University of Edinburgh, where she earned her doctorate in 18th-century literature. Gregory has taught at the University of Durham, University of Teesside, and the Open University and they divorced before the book was published. Following the success of Wideacre and the publication of The Favoured Child, she moved south to near Midhurst, West Sussex, here she married her second husband Paul Carter, with whom she has a son. She divorced for a time and married Anthony Mason, whom she had first met during her time in Hartlepool. Gregory now lives on a 100-acre farm in the North York Moors National Park, with her husband and her interests include riding, walking and gardening. She has written novels set in different historical periods, though primarily the Tudor period. Reading a number of set in the 17th century led her to write the best-selling Lacey trilogy – Wideacre. This was followed by The Wise Woman, a Respectable Trade, a novel of the slave trade in England, set in 18th-century Bristol, was adapted by Gregory for a four-part drama series for BBC television. Gregorys script was nominated for a BAFTA, won an award from the Committee for Racial Equality, and she has written for children. Some of her novels have won awards and have been adapted into television dramas, the most successful of her novels has been The Other Boleyn Girl, published in 2001 and adapted for BBC television in 2003 with Natascha McElhone, Jodhi May and Jared Harris. Wensleydale is the dale or upper valley of the River Ure on the east side of the Pennines, one of the Yorkshire Dales in North Yorkshire, England. The dale takes its name from the village of Wensley, once the town for the dale. Wensley derives from Wodens ley, or meadow of the pagan god Woden, the valley is famous for its cheese, with the main commercial production at Hawes. Most of the dale is within the Yorkshire Dales National Park, part of lower Wensleydale, below East Witton, is within the Nidderdale Area of Outstanding Natural Beauty. Wensleydale was the home of one of Yorkshires most famous clans, the Metcalfe Society hold records dating back to Metcalfes living in the area during the 14th century. They were one of the most prominent families in Yorkshire for over five centuries, sir James Metcalfe, who was born and lived in Wensleydale, was a captain in the army which fought with King Henry V in the battle of Agincourt in 1415. Metcalfe is still one of the most common surnames in Yorkshire, Bolton Castle in the village of Castle Bolton is a notable local historic site. Mary, Queen of Scots, was imprisoned here, wensleydales principal settlements are Hawes and Leyburn, Aysgarth and Middleham are well-known villages. The shortest river in England, the River Bain, links Semerwater to the River Ure, at Bainbridge, Hardraw Force, the highest above-ground unbroken waterfall in England, is located at Hardraw, near Hawes. Aysgarth Falls are famous for their beauty, attracting visitors, they were featured in the film Robin Hood. Other notable waterfalls are at West Burton, and Whitfield Gill Force, Wensleydale stretches some 25 miles from west to east. It lies between Wharfedale, and the quieter Swaledale, on the way it collects the waters of the River Swale, River Nidd, River Wharfe, River Aire, River Derwent and River Trent. Wensleydale is a popular destination in its own right, enhanced by its central location between two other well-known tourist dales and the quieter Swaledale. Wensleydale is a destination for visitors who like walking on mountains, dale-sides. Middleham /ˈmɪdləm, -dələm/ is a small market town and civil parish in the Richmondshire district of North Yorkshire, England. It lies in Wensleydale, in the Yorkshire Dales, on the side of the valley just above the junction of the River Ure. 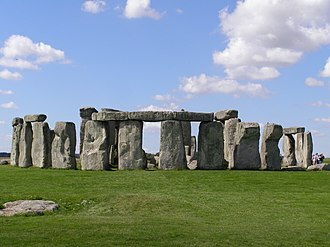 There has been a settlement there since Roman times and it was recorded in the Domesday Book as Medelai. The name means middle ham or village, the first known settlement at Middleham was during the Roman Era. The IXth Legion of the Roman Army conquered York in 69 AD, a branch road from the Great North Road passed through Middleham to the Roman fort at Bainbridge. Near Middleham, the Romans built a station to control traffic on the River Ure. 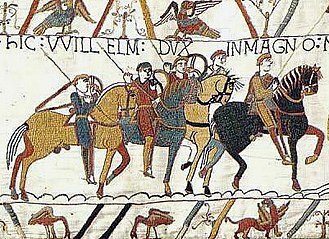 Before the Norman Conquest the lands in this area were controlled by Gilpatrick, in 1069, William the Conqueror granted the land around Middleham to his Breton double-second cousin Alan Rufus who built a wooden motte-and-bailey castle above the town. By the time of the Domesday Inquest in 1086, Alan had given this castle to his brother Ribald and its earthworks are still visible at Williams Hill. Alan built the castle at Richmond, the castle that currently dominates the town, Middleham Castle, was started in 1190. 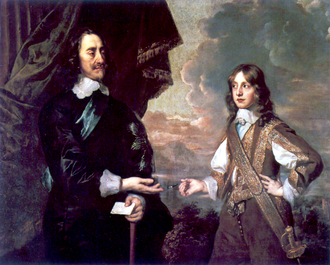 The Nevilles, Earls of Westmoreland, acquired it through marriage with a descendant of Ribald in the 13th century. It was called the Windsor of the North, the castle was in the possession of Richard Neville, 16th Earl of Warwick when his cousin Richard, Duke of Gloucester came there to learn the skills of knighthood in 1462. During the Wars of the Roses, both Edward IV and Henry VI were held prisoner here, Duke of Gloucester became master of the castle in 1471 after Warwicks death at the Battle of Barnet. 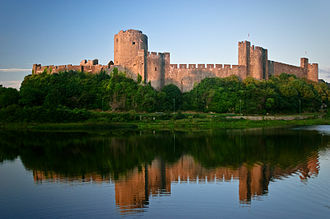 Richard used the castle as his base as he administered the North for his brother Edward IV. Richard married Warwicks daughter, Anne Neville, in 1472, Middleham Castle is where their son Edward was born and where he died in April 1484. 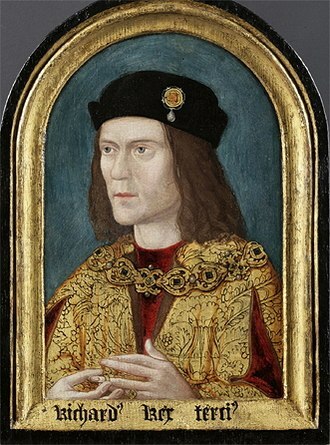 Richard III died in August 1485 in the Battle of Bosworth and he was the last reigning King of England to die in battle. 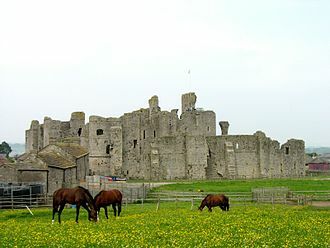 At the time of Richard III, Middleham was a market town. Duke of Cornwall is a title in the Peerage of England, traditionally held by the eldest son of the reigning British monarch, previously the English monarch. The Duchy of Cornwall was the first duchy created in England and was established by charter in 1337. The present duke is the Prince of Wales, the eldest son of Queen Elizabeth II and his wife, Camilla, is the current Duchess. 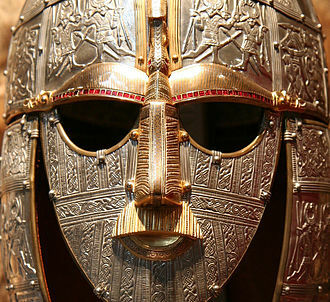 According to legend, Duke of Cornwall under King Uther Pendragon, Uther killed Gorlois and took Igraine, the result of their union was the future King Arthur. 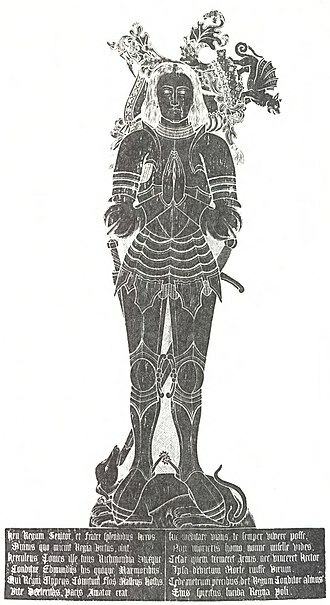 Edward, the Black Prince, the eldest son of Edward III, was made the first Duke of Cornwall in 1337, after Edward predeceased the King, the duchy was recreated for his son, the future Richard II. 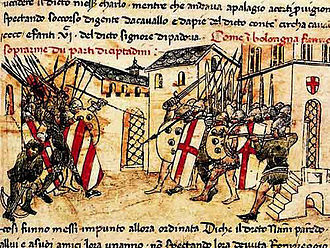 Under a charter of 1421, the passes to the sovereigns eldest son. Cornwall was the first dukedom conferred within the Kingdom of England, the dukedom of Cornwall can only be held by the oldest living son of the monarch who is heir apparent. 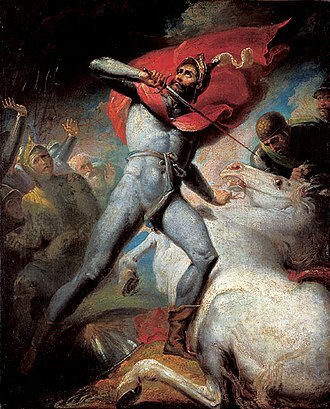 In the event of a Duke of Cornwalls death, the title merges in the Crown even if he left surviving descendants, the monarchs grandson, even if he is the heir apparent, does not succeed to the dukedom. Similarly, no female may ever be Duke of Cornwall, even if she is heir presumptive or heir apparent to the throne. However, if a Duke of Cornwall should die without descendants and has no sister, his next brother obtains the duchy. 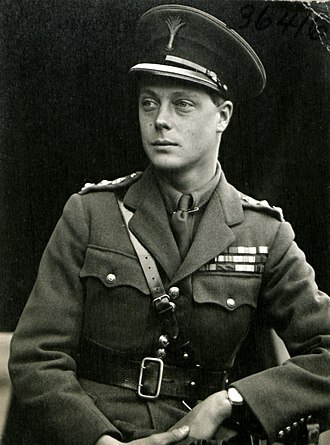 It is possible for an individual to be Prince of Wales, the title Prince of Wales is the traditional title of the heir apparent to the throne, granted at the discretion of the Sovereign, and is not restricted to the eldest son. For example, King George IIs heir apparent, the future George III, was Prince of Wales, James Francis Edward Stuart, son of James II, was born Duke of Cornwall in 1688. Although his father lost the throne, James Francis Edward was not deprived of his own honours, on a Jacobite perspective, on his fathers death in 1701 the duchy of Cornwall was merged in the Crown. On a Hanoverian perspective, it was as a result of his claiming his fathers lost thrones that James was attainted for treason on 2 March 1702, the current Duke of Cornwall is Charles, Prince of Wales, eldest son of Queen Elizabeth II, the reigning monarch. Philippa Gregory at the 2011 Texas Book Festival.